Germany is one of the world’s largest economies and has become a key player in European and global politics. Its language is widely spoken across Europe, especially in the emerging markets of Central and Eastern Europe. 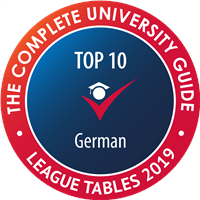 A German degree from Leeds will allow you to become fluent in this powerful language while giving you a genuine insight into German culture and society in the 20th and 21st century – equipping you with valuable skills that make you highly attractive to employers. You’ll consolidate and develop your spoken and written German through core language modules. You'll also choose from a wide range of optional modules including applied language (translation and language for professional purposes) and modules exploring various aspects of German culture, history and politics. 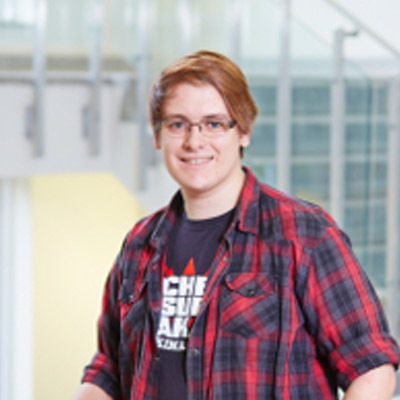 The size of our department allows us to offer a wide variety of module choice, a range of co-curricular events and our student-led German Society contributes to a strong sense of community. Our Language Centre offers plenty of facilities for language students, including digital language labs, audio/video practice booths and Computer Assisted Language Learning (CALL). There’s also an extensive lending library of foreign films and newspapers as well as other on-demand resources. You'll be able to use our German Studies library collections which include leading German newspapers as well as a range of materials in 20th century Germany culture and history. If you’re interested in translation studies, our Electronic Resource Information Centre houses specialised computing facilities and the Interpreter Training Suites offer you the chance to explore a career in interpreting. Your first two years will be spent consolidating and building your language skills in core language modules. In your first year, you will also explore key aspects of 20th and 21st century German culture, history and society and develop important study skills. You'll choose from modules in translation, German history, world literatures, world histories, linguistics and intercultural competence. In your second year, you'll choose from subjects as diverse as German cinema, translation, Germany in the 21st century, marginalised voices in German-speaking countries and Black Europe. It’s all designed to prepare you for your year abroad, which you’ll usually spend in either Germany or Austria, refining your language skills and gaining first-hand experience of the local culture. When you return to Leeds for your final year, you’ll have a fresh perspective on your studies, which will incorporate advanced language learning alongside further optional modules. These will allow you to explore topics such as contemporary German cinema, German memory of the Nazi past or the Holocaust in German and Western Culture, or to focus on translation or German for business. You’ll also apply the critical skills you have developed to an independently researched Final Year Project on a subject of your choice. We use a range of different learning and teaching styles to help you benefit from the expertise of our tutors. They include lectures, seminars and tutorials, or occasionally workshops. Independent study is also an important theme throughout your course, since it allows you to develop your research skills and think critically about what you read. We have excellent library resources to help you, and the University Library runs training programmes to help you get the best of them. We also use various types of assessment. Coursework makes up the majority of our assessments, often including language portfolios and essays. In some modules, you may also be assessed by group projects, professional language projects, podcasts, video blogs, business pitches, posters or mini exhibitions. We offer support in these areas as well. Support for assessments is integrated into our teaching and you'll usually have the opportunity for formative assessments that allow you to practice your skills and do well in your formal assessments. We also run extra classes on skills such as public speaking, structuring essays and exam technique that you’ll be able to attend throughout your time at Leeds. A-level: ABB including B in German. Where an applicant is taking the EPQ in a relevant subject this might be considered alongside other Level 3 qualifications and may attract an alternative offer in addition to the standard offer. If you are taking A Levels, this would be BBB at A Level including German and grade A in the EPQ. We welcome applications from mature students with Access qualifications, and from students with a wide range of qualifications. Pass diploma with 60 credits overall, including at least 45 credits at level 3, of which 30 credits must be at Distinction and 15 credits at Merit or higher. An interview and a piece of written work may also be required. This course has additional subject specific requirements. Please contact the Admissions Office for more information. M1, M1, M1 including German. 34 points overall with 16 at Higher Level including 6 in German at Higher Level. BB in Advanced Highers including German and AABBB in Highers, or B in German in Advanced Highers and AAABB in Highers. European Baccalaureate: 77% including 80% in German. Typical Access to Leeds offer: BBC at A Level including B in German and pass Access to Leeds. We accept a range of international equivalent qualifications. For more information, contact the School of Languages, Cultures and Societies admissions team. IELTS 7.0 overall, with no less than 6.5 in any component. For other English qualifications, read English language equivalent qualifications. You'll graduate with proficiency in one of Europe’s most commonly-used languages and have a real appreciation of the culture in one of the world’s major economic powerhouse. Combining your knowledge with experience of living abroad provides you with access to a wide range of careers in Germany and elsewhere around the world. Your degree will also equip you with valuable skills such as teamwork, presentation, communication, research, critical thinking and analysis which are highly desirable to all kinds of employers. These qualities will open doors to a wide range of careers across different industries. Recent graduates have pursued careers in areas such as journalism, PR, business and finance, HR, law, teaching and social work. They’ve gone to work in organisations such as the NHS, the Department for Work and Pensions, Mitchells and Butler and Deutsche Bank. Others have studied for a postgraduate qualification in translating or interpreting to pursue language-based careers or continued to study German language or culture to Masters level, either for a PhD and career in academia or to further their knowledge. We are committed to helping you achieve your career ambitions. The School of Languages, Cultures and Societies careers and employability support includes promoting internships, providing opportunities to work for the School and employer-led workshops and events. You’ll spend your third year in a German-speaking country, immersing yourself in local culture and cultivating your language skills. Whatever you choose to do, you’ll gain a new insight into German-speaking society as well as valuable experience of adapting to another culture. For many of our students, it’s the real highlight of their course. We have partnerships with a number of universities in Germany where you can study alongside German students. Alternatively, you could undertake a paid work placement either with one of our partner firms or with an organisation of your choice. You could even work as a language assistant in a school under the British Council’s programme.